Deputy Attorney General Rod J. Rosenstein. Deputy Attorney General Rod Rosenstein came to his boss's defense Thursday, saying it was "bizarre" for anyone to claim Attorney General William Barr is "trying to mislead people" by not immediately releasing the special counsel's report. In an interview with the Wall Street Journal, his first since Robert S. Mueller III concluded the investigation into Russian interference in the 2016 election, Rosenstein tried to tamp down criticisms of Barr's handling of the report and the time it is taking him to release it. 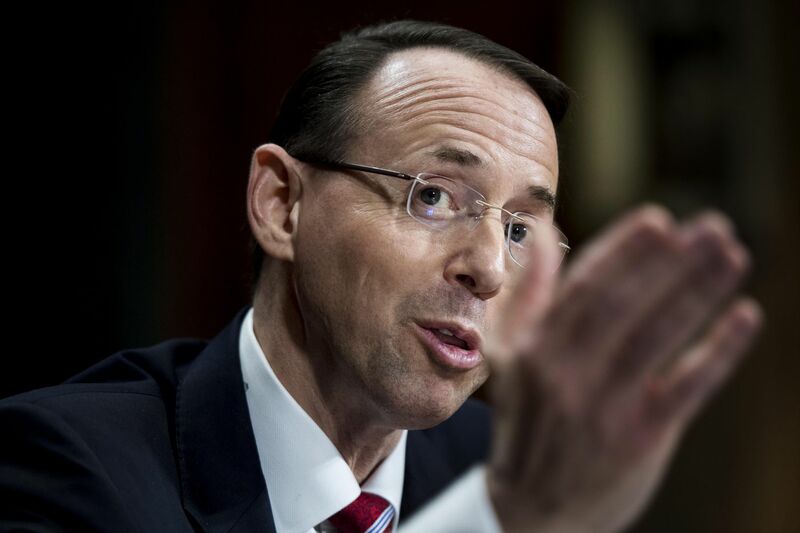 Rosenstein, who appointed Mueller to lead the investigation after President Trump's firing of FBI Director James Comey, helped Barr review the final report, which did not find that anyone on the Trump campaign conspired with Russians. However, Mueller declined to reach a conclusion on whether the president obstructed justice. Barr and Rosenstein then decided they could not make a criminal case that the president obstructed justice. Barr has faced intense criticism for a four-page letter he sent to lawmakers last month outlining what he said were Mueller's "principal conclusions." Barr quoted a few snippets from Mueller's report to support his assertions, but his missive left many questions unanswered. Barr has told Congress he hopes to release the full Mueller report next week, but Justice Department officials are first redacting sensitive information including grand jury proceedings. Democrats are concerned that Barr's team will redact certain findings to protect Trump. "It would be one thing if you put out a letter and said, 'I'm not going to give you the report,' " Rosenstein said. "What he said is, 'Look, it's going to take a while to process the report. In the meantime, people really want to know what's in it. I'm going to give you the top-line conclusions.' That's all he was trying to do." Some on Mueller's team have told associates they are frustrated with the dearth of information released so far about their work, people familiar with the matter have said. Barr has insisted that he was not trying to summarize Mueller's nearly 400-page report with his four-page letter, but rather was aiming to provide its main findings to a public that would not tolerate waiting weeks to learn anything about the results of the special counsel probe. Rosenstein told the Journal that the public should have "tremendous confidence" in Barr.